NotBlueDesigns Arm Slings are beautifully crafted, elegant, unique, stylish, sophisticated and luxurious - couture, on-trend high-end designer fashion slings. Universal right and left arm usability. Arm Sling - Fab Fur Designer Fashion Arm Sling. Arm Sling - All That Jazz Designer Fashion Arm Sling. Arm Sling - Peekaboo Blonde Designer Fashion Arm Sling. Arm Sling - Sparkly Scroll Fashion Arm Sling. 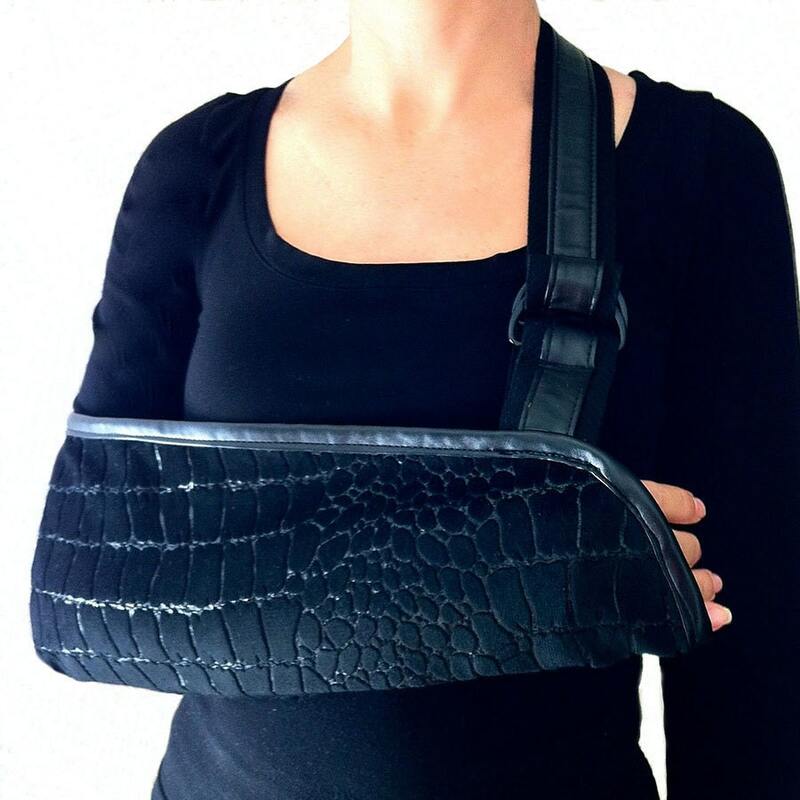 Arm Sling - Gold Coast Designer Fashion Arm Sling. Arm Sling - Carnevale Fashion Arm Sling. Arm Sling - Sensuous Sequin Designer Fashion Arm Sling. Needed a sling for an upcoming operation that will leave my hand immobile for a bit. Was able to ask several questions before purchasing and never felt like a bother. Love the sling and it’s comfort. 1. Comfort!!! 2. I love looking fashionable even though I am needing to wear an arm sling for over a month. So, I bought the faux leopard one too! Another great quality with this product is of course the quality, but the care and personal touches Kate puts in when getting you your purchase asap is hands down the BEST! Kate encloses a special note! She even got my 1st arm sling to me expedited due to special circumstances. I will always recommend her and her beautiful detailing of products! Arm Sling - Cutting Edge Designer Fashion Arm Sling. Arm Sling - Pretty in Pink Designer Fashion Arm Sling. Arm Sling - Luxe Lace Designer Fashion Arm Sling. Arm Sling - Houndstooth Designer Arm Sling. Arm Sling - Wild at Heart Fashion Arm Sling. Arm Sling - Flannel Designer Arm Sling. Arm Sling - Bohemian Rhapsody Designer Lace Arm Sling.